The UK made VWDT drive-through platforms are extra low profile, at only 40mm high, ensuring easy access and minimum floor space requirements. Professional manufacturing and high quality components ensure reliable, accurate and long-lasting weighing performance. Includes entry and exit ramps, 300mm long to reduce the loading gradient for unstable or low clearance trolleys. Smooth top plate ensures small wheels or casters can be easily accommodated. 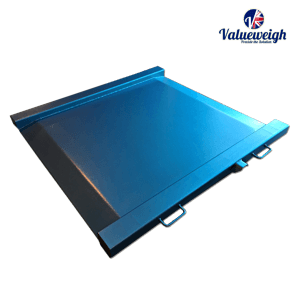 A durbar top plate is also available to help reduce the risk of slipping if required. IP67 rated stainless loadcells, a sealed stainless junction box and a tough professional powder-coated finish ensure durability and long lasting performance. To provide portability during cleaning & maintenance, handles are supplied as standard. Note: Capacities refer to spread load only. No point/centre loading.